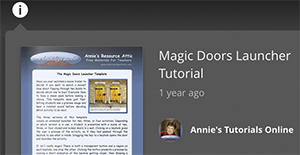 The documents you read in Annie’s Tutorials Online are hosted on a self-publishing site, issuu.com. It offers paid premium memberships, but I’ve signed up for their basic, free account. issuu provides the code I use to embed each tutorial thumbnail in a page. When I first uploaded tutorials to issuu.com, displaying a document required using a Flash® plug-in that many browsers kept disabled by default and that was not supported at all on iPad®. In early 2017, issuu completed a major site redesign. Now everything is coded in HTML 5, a format supported by all browsers and devices, including iPad. The interface is much cleaner, but Search and Embed functions have been removed; temporarily, they say. For now, download a PDF copy from the activity set main page and use the Search function in your PDF reader app. If you need to embed a tutorial in a web page, contact me. Tell me approximately how many pixels wide you want to display it. As a publisher, I can still get embed code, and will gladly send it to you. Below are some tips that I hope will avert most problems you might encounter. Click the icon in the center of the thumbnail to launch full-screen view. You could flip through the pages of the thumbnail by means of the small white arrows, but it’s easier to work from full-screen. The actual size of the tutorial displayed depends on the screen size of your device or monitor. The full-screen display has the same layout on all devices. I’ve numbered the controls you will need to use. 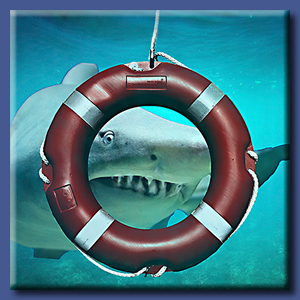 Other icons generally lead to issuu offers of publishing plans or other things to read. The Share in the upper right corner gives you a link to the tutorial on issuu, where it’s surrounded by ads. 1. Navigation arrows. On the cover page, there will only be an arrow on the right, but as soon as you turn the page, the left arrow will appear. 2. Exit full-screen view. 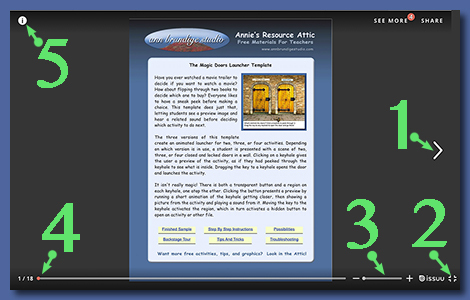 Click or tap this icon to return to Annie’s Tutorials Online, on the page where you opened full-screen view. On a computer, you can type ESC to exit full-screen. 3. Zoom controls. Click the plus sign several times to zoom in on part of the page. This function might be helpful if you are presenting to a large group. Click the minus sign to return to viewing the entire page. Of course, on a tablet you can zoom in and out using gestures instead. 4. Jump pages slider. Click or tap along the track to slide over several pages. Using the fraction at the left, you can guess fairly accurately where to click to get close to a certain page. 5. Link to Annie’s Tutorials on issuu.com. I don’t recommend clicking this button, although it is a way to see thumbnails of all the tutorials at once, displayed as a library. If you open a tutorial directly on issuu.com instead of from the thumbnail embedded on my website, you don’t get the full-screen view, and there are ads all around it. 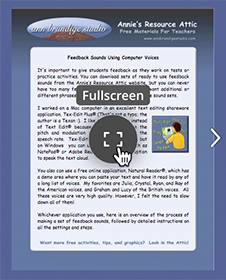 When you exit full-screen view, you go back to the page where you started in Annie’s Tutorials Online. 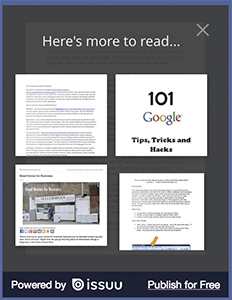 However, issuu puts a selection of items to read next into the thumbnail, rather than the tutorial cover. If you need to open the tutorial again, click or tap the X in the upper right corner of the thumbnail, or refresh the page. The cover image and button for full-screen view will reappear. Click or tap the link where it says “Publish For Free” only if you are interested in setting up an account and publishing on issuu. I do like their new interface, and they tell me they will never remove my publications, even though it is a free account with only a small elite group of readers.